About two years ago, when I began going into old, run-down buildings simply to photograph them, I had more than my share of fear of being caught. Now, after dozens of dashes into the spaces of historic structures of all shapes and sizes I can say with confidence that I no longer pump quite as much adrenaline as I once did. It’s been replaced largely with a confidence and a brazenness that sometimes scares even myself. For in my day-to-day life I rarely possess such confidence. To reflect back, 30-seconds after making a mad dash across razor wire and security cameras – it all just seems so insane. For what? A few snapshots? But when I question these things; when I think to myself how incredibly useless (and often stupid) it is, I think back to the day that I first found myself possessing that confidence. I was about a year-and-a-half out of college and somewhat lost – as I still am – in the great confusing whirlwind of post-college soul-searching. It was only a few months after I entered my first sanctuary of sorts, but I had never tasked myself to what I was about to do that night. Earlier in the day I had scoped out a grand, Beaux Arts building that first housed Gianninni’s famed Bank of America, eventually becoming the headquarters of the Key System (the pre cursor to all of our modern mass-transit systems in the U.S.) Her tall, imposing hulk stood guard – like a spectre of the past – over the modern high-rises and hotels that surrounded her. Her windows were littered with a chromatic representation of 30 years in Graffiti history. I’m sure many of the artists are long gone from this world. From the street, the Key System Building is not just imposing, but also a subject of curiosity. Sit down across the street from 1100 Broadway and you’ll find that passerby glance momentarily at the 8-story brick tower. Cars reduce their speed. Kids on skateboards take a quick detour for a better view. I myself took 20 minutes to admire its horshoe-shaped positioning, the ornate, carved frieze. I took notice of its weathered brick. All of it began to look like a giant birthday cake that was a photographer’s dream. The unique situation with the Key System Building was its difficulty to infiltrate. Most places that urban explorers tend to frequent are easily accessible. In fact, parking in front and squeezing between the bars of a fence is often all that’s necessary. But the Key System Building – she was well secured and well-watched. Getting inside of her meant being noticed. The front door was layered behind a fence, and even the door itself was locked. On the western face was an opportunity – a small opening in a second-story window with a decent-sized water pipe protruding from the wall below it. Still, I’d determined it to be impossible – even with the assistance of the pipe. Two hours later, a friend and I returned. I had bought a ladder at Home Depot. My heart was racing. We walked straight up to the window as 30 onlookers (soon to be bus passengers) watched us from across the street. “Are You Crazy?” One of the passengers shouted from across the street. My fellow explorer and I paid no attention. We scampered up the ladder and looked out from the dark recesses of the window to see the crowd boarding the bus. But there was someone else – an Oakland police officer walking straight towards our lowered ladder. His eyes were gazed intently in the distance, and then he suddenly turned away. We peeked out the window to see that he was frantically trying to put out a fire in a trash can. We took the opportunity to pull the rope attached to our ladder into the platform. As we looked down into the lobby of the Key System Building our eyes widened in amazement. The explorer next to me was an archeology major. Before us was detritus buried under a century of soggy asbestos and drywall. 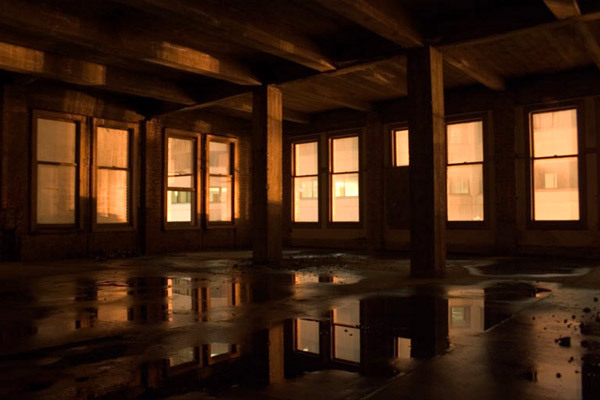 The quietness of the space was only punctuated by the dripping of a leaky ceiling. Below us stood a classic 1940s-era desk with a swivel chair, covered in dust. 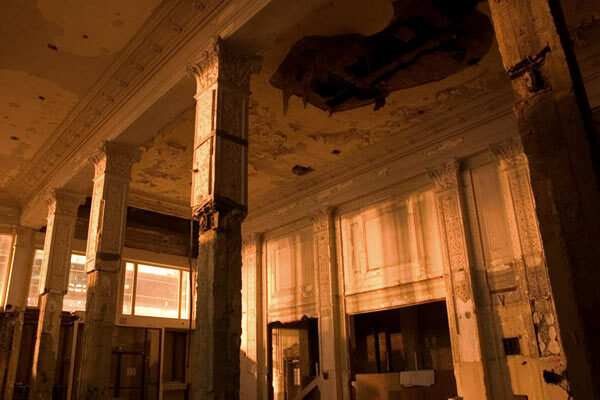 The pillars in the center of the room – thin columns of concrete – were frosted like a cake on their top 15 feet by broken and cracking plaster in ornate design. Luckily, we had the ladder, because there was no way down into the lobby from our high platform. After descending, we walked to the grand entrance. The remnants of what was once a crystal chandelier (but had morphed over the years into a thin wire hanging from a rusty chain) hung ominously from the ceiling. The address – backwards – read 0011 yawdaorB. Pedestrians walked by, paying no attention the two dark figures photographing in the shadows of the building. I would like to say that the building was filled with all kinds of trinkets and bric-a-brac from the 1920s. Unfortunately, this wasn’t the case. Despite the fact that the wrought iron staircase remained intact and as beautiful as it ever could be – there wasn’t much to see within the building. On the top floor, however, were fliers from an 80s rave . I could only imagine college kids and recent high school grads, sneaking into this dark building without being noticed. 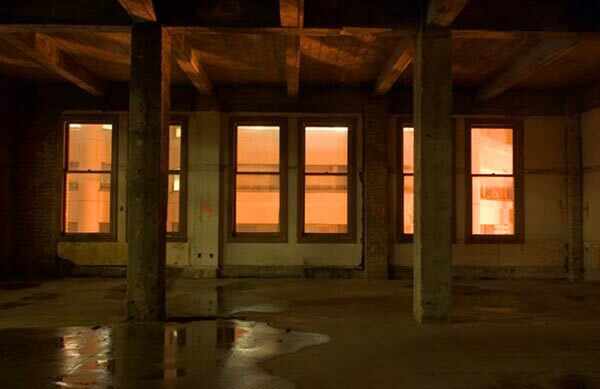 The top floor windows were covered with black plastic – perhaps to prevent people from noticing the flashing lights, lighters, and glow sticks spasmodically gyrating inside to the beat of the music. 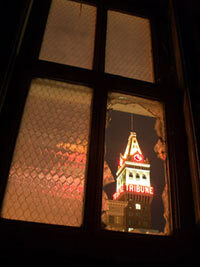 We made the final ascension to the top of the building and looked out towards the Tribune Building. We could see the movement below us – out – far into the distance of the Bay. It was such an eerie feeling to be in the middle of it all – yet so separated. All around us was activity. And there we were, in a building forgotten by bustle and resistant to modernization – a quiet building that had lived her days in glory only to see them end as a silent, graffiti covered bone of a time-gone-by. I stood my camera on a tripod and set the timer. 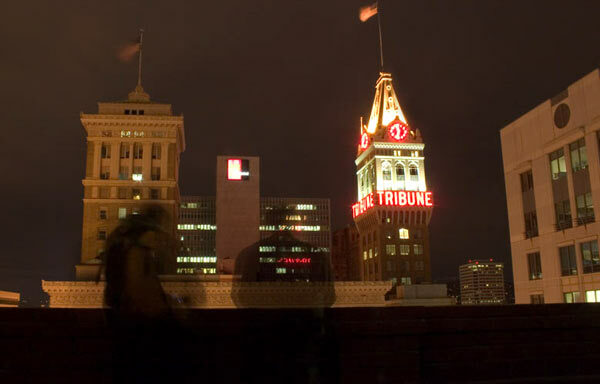 The two of us got in position for a final photo, looking out from the darkness of the Key System roof towards the bright Tribune Building lights. Descending, our steps were slower, and a bit more contemplative. We exited the window when nobody remained on the city streets. I tossed the muddy ladder into the back of my truck and bid farewell to my fellow explorer. When I returned home, the sun was rising in the East and I could hear birds outside. My eyes were bloodshot, but I couldn’t sleep until the photos were imported into my hard drive. The final photo appeared on the screen. Because my camera’s shutter had been open for a few seconds before the two of us took our positions, our bodies had appeared semi-transparent. Ironically standing on a ghost of her own merit, We looked like two living ghosts considering the threat of modernization ahead of us – with its lights, and progress, and fearful-yet-mesmerizing technological breakthroughs. There was something to be said for the simplicity and the raw idealism that the Key System Building represents. I couldn’t quite make out why it had such a profound effect on me. For me, it was a turning point. I may still not understand who I am, or what I plan to do from here. In fact, I probably know less about that than I did when I graduated from college. But at least I feel a bit more comfortable knowing that’s okay, because if there’s anything that’s worth celebrating it’s the absurdity and beauty of life, no matter how forgotten or dark it may become, and how bright and promising everything outside of you may seem. This entry was posted on Tuesday, December 9th, 2008 at 1:03 am	and is filed under Built Environment, Geotagged, History, Must See Geography. You can follow any responses to this entry through the RSS 2.0 feed. You can skip to the end and leave a response. Pinging is currently not allowed. Well, you certainly showed due diligence to earn to earn those photographs. Thank you for being brave enough to do this and write so well about your findings and being our intrepid nosy neighbour. Your combination of words and photographs always paints a delightful, well rounded story. Thank You, Rosemary. What keeps me going are my readers, so I’m always glad to provide a little inspiration in any way – and I especially love hearing from those who read. I even enjoy criticism from time to time. It’d be great to hear from you more in the future. You make the building sound like a portal to opportunity, a desire, or a future. To an ordinary person, they would look at the building and just keep walking by, but you see it as an adventure a piece of art, maybe even a dream. I admire that passion and hope that you don’t lose that sense of wonderment and excitement as you get older. You have the opportunity to jump over that fence and climb those walls that make you feel caged inside your own domain. Break free and explore! There is no point trying to say what my fellow commenters have said far more eloquently than I can in my just-got-out-of-bed muzzy headedness. But I mirror their sentiments. And thank you. This is a beautiful piece, Jon. Very eloquently written, and as a fellow explorer, I think it captures the essence of why we do what we do. You’re right…we do crazy things “for a few snapshots”, but the truth is, I don’t even stop to think about it very often. Besides my interest in creating art and documenting these places that may not be around much longer, urban exploration satisfies my innate curiosity of the unknown as well as my sense of adventure. It’s primarily the adrenaline and adventure that keeps my rational side at bay, I think. Amy’s been encouraging me to read this for awhile, and I’m glad I did. Thanks, Scott. I tend to agree with you. The longer I’ve been doing this, the less and less I have grand notions of preserving some piece of the past – and the more I do it for the experience, camaraderie, the ways it bends your mind and challenges ones nerves – a lot of it is about the visceral experience and the memories – the people you get to know in the process. It’s been a heckuvva few years we’ve all been shooting and it certainly makes for great laughs later in life. service as a movie location (to paraphrase Shakespeare, in So. Calif. Interesting to hear about the Pacific Electric Building in L.A. I’ve done a few spots down there myself and plan a few more in the near future. As far as the key system building is concerned, you were correct in assuming that there are plans for its restoration. 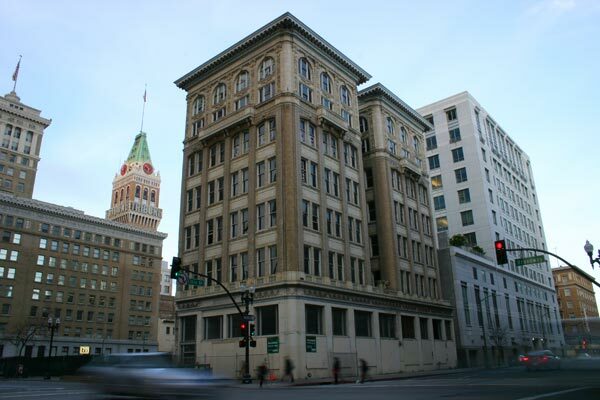 1100 Broadway should eventually become an adjoining office space for the University of California. I’m not quite sure if the plans have been shelved due to the economy and all, but you’ll be happy to hear that all of the historic components (especially the wrought iron staircases) will remain just as they are. Re Key Route Building. 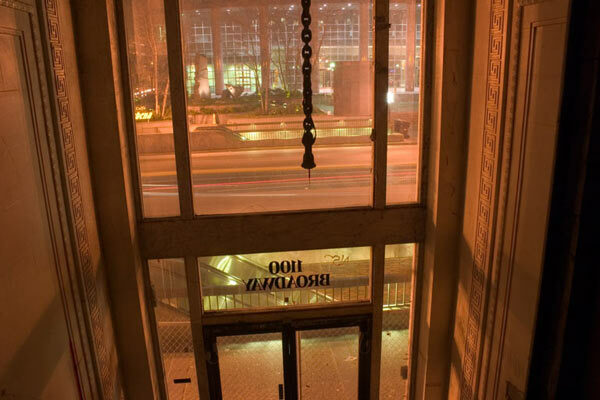 In 1997 there was a gap in the chained doors and the lobby chandelier was still there. Amazing site, photos, write-ups and links. Lucked into this from Wikipedia article on swimming pools. I’ve always been fascinated by old,, especially abandoned, buildings. Thanks so much for sharing your adventures with us! hi, just stumbled upon this, after wondering if anyone has ever gotten in that building. thank you so much. i love places like that and haven’t been to a new one in the area in a long time. This is really quite a beautiful building in downtown Oakland. There was a plan some years back to convert it into a Hilton Gardens Hotel, but that fell through for whatever reasons. The most recent plans are to restore the keystone building into offices with a LEEDs certified glass building. The concept drawings look great. Now we just need this economy to improve so that the developers can get on with this. Truly touching photos & story, my friend! I’m sent back reeling of the 2.28.12 comment above about possible development when “the economy improves” – its mid-2015 & still waiting. How many other noble properties have continued to decay w/o financial intervention/demo? Ever onward with the ‘absurdity & beauty of life’ as you say so well. Love reading your adventure stories and seeing the pictures of places I had no idea existed. The condition of some of the places I have seen you photograph are unbelievable. Thank you, Lana. Appreciate the kind words. Perhaps this will encourage me to return to posting on this somewhat defunct website.